Now a video is available to spread the UGRs message! Ever wonder why - despite best intentions, despite the highest quality training, and despite the most articulate of service standards - the service provided by your team is less than outstanding? The answer is now available. Intuitively we know that 'Unwritten Ground Rules' direct behaviour. These unspoken rules are powerful and compelling - the 'secret' is to recognise them, then to re-shape them to boost the performance of your team. 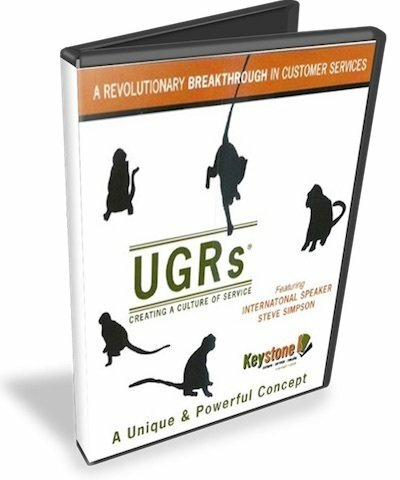 This hard hitting 15 minute video features Steve Simpson, the creator of the UGRs concept. Use it at your next staff meeting and hold on to your chair- the impact could start a service revolution! The video is available for you to download and view immediately. NOTE: After purchasing this video, you'll be sent a personalised link to download & watch the training.